All diets have one thing in common: they all restrict caloric intake. But are all calories created equally? We have all heard the term “you are what you eat” and much of this is determined by your macronutrient intake. Macros, or macronutrients, are the nutrient groups your body uses for energy. This means they are the nutrient groups which contain calories. There are three main macronutrients: fat, carbohydrates (known in the gym as carbs), and protein. So, what is the difference between each? Carbs and protein both have 4 calories per gram, while fat has 9 calories per gram. 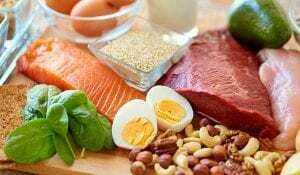 This means it is much easier to overeat fat as opposed to protein or carbs. This is why people who diet on salad often end up gaining weight. Each tablespoon of dressing is often the same amount of calories as a large portion of bread and most people drench their salad in dressing. Protein is the building block of tissues in your body. Protein is essential for recovery from workouts and keeping your muscle tissue during a diet. Protein can be found in the highest volumes in meats. Not all proteins are created equal, but some of the best sources include eggs, poultry, and seafood. Fat is essential for brain development; fat stores energy, insulates us, and protects our vital organs. Over-consumption of fat will quickly lead to fat gain. High volumes of fat are found in foods like oils, avocado, egg yolk, cheese, and nuts. Carbohydrates are the body’s most accessible energy source. Upon consumption, carbs are digested and enter the bloodstream as sugar. The sugar is then shuttled into your cells as an energy source. Foods like grains, vegetables, fruits, and milk. Lactose is a carbohydrate. All three macronutrient groups are essential for peak performance. The macronutrient breakdown you choose for your diet will determine your energy levels and how much muscle you retain. Make sure to measure fat strictly when dieting by using measuring spoons or a food scale.